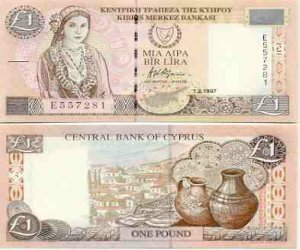 The Cypriot pound was replaced by the euro in the Republic of Cyprus on 1st January 2008. In 1879 The British introduced to the Cyprus Republic, the sterling pound. In 1955, Cyprus decimalized with 1000 mils to the pound. Colloquially, the 5 mil coin was known as a "piastre" and the 50 mil coin as a "shilling" (an exact equivalence). At that time, the smallest coin still in circulation was that of 5 mils. This was renamed as ½ cent, but soon was abolished. Mil-denominated coins are no longer legal tender. Towards the end of the Cypriot pound era some cashiers omitted the 1 and 2 cent coins from the change they gave. Owner operated businesses often rounded down the net amount to be paid to the nearest multiple of 5 cents. The national currency was replaced by the euro on 1 January 2008. The currency entered the Exchange Rate Mechanism II on 2 May 2005 and it was limited within the band of CYP 0.585274 ±15% per euro. A formal application to adopt the euro as Cyprus currency was submitted on 13 February 2007. On May 16, 2007 Cyprus (along with Malta) won the European Commission's approval for this and was confirmed by the European Parliament on 20 June 2007 and the EU leaders on 21 June 2007. The permanent exchange rate, EUR 1.00 = CYP 0.585274, was decided by the EU Finance Ministers on 10 July 2007. From 12 July 2007 to 5 December 2007, the exchange rate remained at 0.5842. Since 7 December 2007, the rate has been fixed at the irrevocable rate, € = £0.585274. In Summer 2006, the Bank of Cyprus started including on its statements the indicative balance in euros. The Cyprus Telecommunications Authority followed suit with its bills two months later, to allow for the change in Cyprus currency. A small number of shops also showed indicative euro totals on their receipts. By late Autumn 2006, the number of banks and shops offering indicative euro equivalents on their statements and pricing had increased significantlydue to change in Cyprus currency.